Giving voice: Chris McCormack reviews a rarely-performed work by Tennessee Williams. Something Unspoken at Bewley’s Cafe Theatre, Dublin. Photo: Futoshi Sakauchi. What will break the silence? For Tennessee Williams, it took the stage and all of its public exposure to resolve the anguish of his personal life. His itinerant shoe-salesman father, suffocating mother and psychologically fragile sister are all drawn in the playwright’s first hit: The Glass Menagerie (1944). Even his shamed homosexuality was given sympathetic shape in the sadomasochistic desire of Blanche Dubois in A Streetcar Named Desire (1947), and Brick’s retreat in Cat on a Hot Tin Roof (1955). Homosexuality was bold material for the US stage in the 1940s and 50s. On the one occasion Williams gave it female form, it was a one-act opening for the hair-raising Suddenly, Last Summer in 1958. Something Unspoken has rarely been seen since. 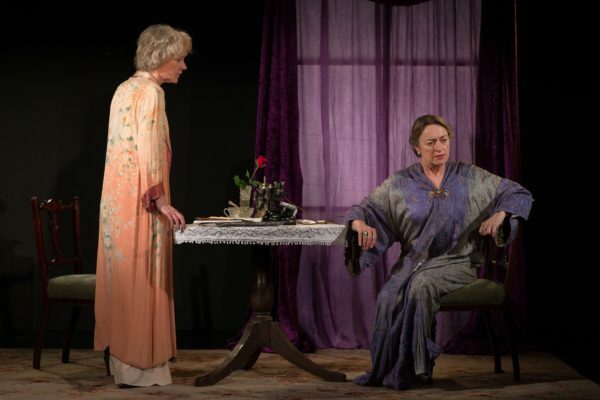 Director Maisie Lee knows well the optics behind this; her staging of an illuminating revival by Bewley’s Café Theatre begins with a woman’s silhouette against a closed amethyst curtain, an undiscovered figure hidden from plain sight. Whatever society’s misgivings about gay men over the years, lesbians have been granted less visibility. Catherine Byrne’s polished Cornelia is an aristocrat of Louisianan wealth and proud member of the Confederate Daughters’ Society. But on the day of the Society’s elections, she stubbornly insists on staying at home to manipulate the outcome from her office. She instructs a stooge to nominate her as regent but if another runner enters the race then Cornelia’s name must politely be withdrawn. The irony of this indirection isn’t lost on her, as she turns to the unsaid state of her personal life: a relationship with her secretary Grace, played by an excellent Noelle Brown. While Cornelia attempts to address their history, Grace is evasive. Forces from within and without threaten to drive them off course. A ringing phone constantly interrupts the sanctuary of Andy Murray’s set and Barbara McCarthy’s floral robes, and a smoothing gramophone distracts from the issues at hand. With Brown’s quiet power, Grace is fraught but, poignantly, remains dutiful, diving to answer the phone whenever it rings. At one point, she achingly describes the differences between them in their twilight years: Cornelia, social celebrity and authority is the colour of iron, and Grace simply a dull grey. “When a silence between two people has gone on for a long time it’s like a wall that’s impenetrable between them! Maybe between us there is such a wall”. That’s the crux of a play less interested in knocking the wall down than exposing its chinks. After the figures smoulder to black in Colm Maher’s gorgeous lighting, William’s drama feels like progress. Something has finally been spoken. Something Unspoken is on until 23rd July 2016. Click here for more information.